Oysters have been a part of brothers Tommy and Adam Waller’s lives for as long as they can remember. Growing up the oldest of seven children in Louisiana, oysters were always an important element of special family occasions. 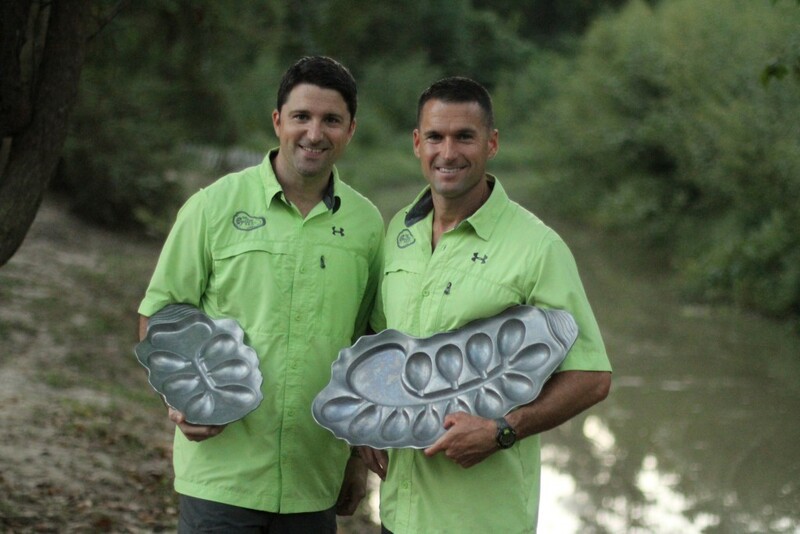 Their passion for oysters and coastal living sustainability led them to follow their dream and create The Oyster Bed, a reinvention of the oyster plate, and possibly the way we cook oysters. We recently spoke with Tommy Waller about his oyster obsession. Oysters Bienville prepared on The Oyster Bed. What gave you the idea to create the Oyster Bed? 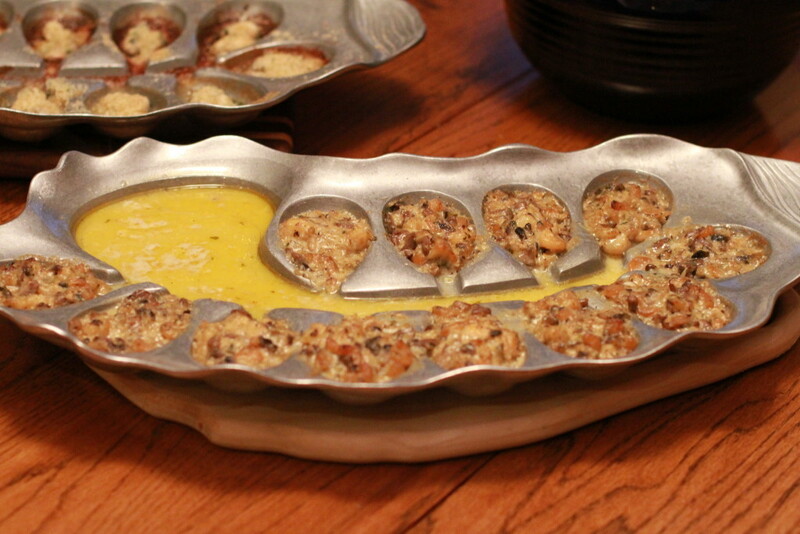 We first tried putting the pre-shucked oysters in a muffin tin, but it didn’t work well. The oyster has seawater that drains and adds great flavor, but in the muffin tin it has nowhere to go. It just creates a soggy mess. When you cook the oysters on the half shell, sometimes you get the right consistency, but if the shell is flat then the oyster will shrivel and be kind of dry because all that good flavor from the seawater spills onto the grill. Experimenting led us to envision creating a way to make pre-shucked oysters taste delicious. What inspires you when it comes to creating and marketing your products? And running your business? Simon Sinek’s video, “Start with Why,” had a powerful impact on our business. Sinek says that every company should try to imagine that they have three circles. The very center circle is the “why,” which is the most important part of the business. From day one Adam and I tried to really think about and focus on the why of our business. The first part of the why is to bring people around the table and closer to God. The second reason is to recycle the oyster shells. Louisiana is losing the equivalent of a football field of wetlands every hour. Sending oyster shells back to the water helps to preserve the reefs. Our final goal is to cultivate creative cooking. It will be five to six years of being in business before we will pay ourselves so we feel like The Oyster Bed has a pretty great purpose. Any particular chef or restaurant using the Oyster Bed in an innovative way? We’re just starting to get into restaurant market. We are fortunate to have a relationship with some chefs from the Landry’s line of restaurants—a few of their chefs have just started to use the Oyster Bed. One of the chefs we’ve always been a fan of is chef John Folse. He’s given us the opportunity to cook around Louisiana, and connected us with people around the state. One of the guys I want to get together with is chef John Besh, especially since he’s a former Marine. We gave him a coveted “Le Perle” Oyster Bed during our Kickstarter Campaign. We couldn’t believe that no one had ever thought of creating a cooking product that had a bunch of individual cooking wells that drained into a reservoir. What’s cool about the Oyster Bed is that even if you cook something other than oysters in it, as all the excess juices drain out of the well, they combine together in the reservoir for just the right flavor for whatever you are making. The Oyster Bed also cooks a pretty tasty surf and turf. If you start by searing a 6 or 8-ounce filet on the grill and then you finish it in that big reservoir as the shrimp and scallops cook then you get an incredible flavor. And the platter itself is unique in that it encourages oyster shell recycling by using pre-shucked oysters. 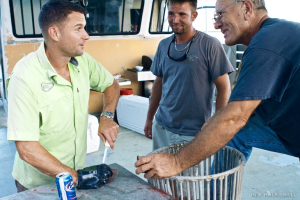 What’s the process for creating the Oyster Bed? We developed the cooking wells to hold 15 milliliters of cooking fluid. Adam measured the fluid retention in hundreds of oysters to get the perfect amount in the cooking wells. What’s your favorite part about your job/business? We love telling people about what we do and why we do it. And we love serving people oysters from the Oyster Bed. We were invited to cook for the Miss USA Pageant last year. And we obviously took our wives with us. The awesome thing was that some people were confused and thought our wives were part of pageant. We had a great time serving folks there. We were also invited to cook for the NOLA’s Backyard event. 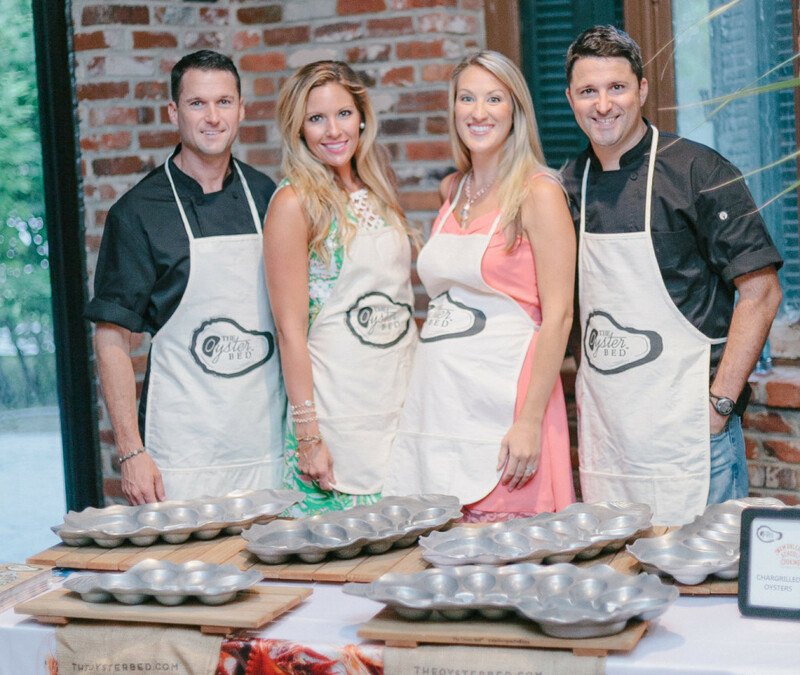 The Louisiana Seafood Marketing and Promotion Board invited some of the nation’s top professional chefs to taste the seafood. We got to serve them oysters, which was such an honor. Adam and I are not professionally trained chefs so we were humbled by it. I mean we don’t even have credentials to serve food in a fast food restaurant. The Wallers sharing the Oyster Bed story at an event. The cost of doing business. We were surprised by the length of time an owner can go without giving himself a paycheck. We talked to someone who owned a foundry in Alabama who didn’t pay himself for twenty-three years. Adam and I are fortunate that we each have additional jobs. If we didn’t have those other jobs, we couldn’t do it. We focus on the why of the business. We’ve been blessed—whenever we need something it always comes through. We depend on the Lord to bless us. What city do you think has the best oysters? Obviously New Orleans is our favorite city for anything culinary. New Orleans is where it all comes together. 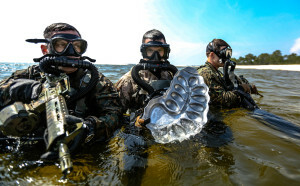 I will tell you, though, and it’s probably the arduous nature of making it through the Marines, but probably some of the best I had were Apalachicola oysters in Panama City, Florida, after the last graded nighttime dive I had with the Marine Combatant Dive School. I think a lot of that was mental. A handful of Marines went to an oyster bar after we finished, and they were the best oysters I have ever eaten. How do you think the Kickstarter campaign influenced your business? Kickstarter was a cool opportunity. So many people told us we had to do that. The neatest thing is that we became the number one Kickstarter campaign for the state of Louisiana. And, best of all, we got everyone their products when promised. And that doesn’t always happen with Kickstarter. Everyone who gave us their shipping address, got their product on time. Some products we even had to drive to people’s houses. Last Christmas out of all the orders we had, the shipping carrier failed to deliver two of them on time. Thankfully, those two were in Louisiana so Christmas morning I drove and delivered those Oyster Beds to them. We try to make sure the customer gets what they came for. It would have been impossible if it had been in Michigan or something. Right now it’s the large Oyster Bed. Restaurants like the small version. The larger one is by far the most popular with home cooks. Any new products on the horizon? We do have some. I can’t talk too much about what they are. We would like to launch them in 2016, but it’s going to be tough because the amount of money it takes to apply for a patent and bring a product to market. It took us from 2011-2014 to bring the Oyster Bed to market. So we have product ideas we came up with last year that we hope to bring to market. It just depends on how many credit cards we can max out. And, most importantly, what’s your favorite way to eat oysters? I like to eat them raw. A friend of ours jokes that she can’t believe we went through all this effort to make this product because we like to eat them raw. Personally, I like them on an oyster boat out in the gulf—that’s my favorite with a cold beer. On an oyster boat you can just smell the ocean. When you’re in a land-locked state and you order oysters on a half shell, you can be thousands of miles from the ocean, and you can still taste the ocean. As a Marine, we eat and breath on the ocean. There’s so much history I have with the Marines having that taste of saltwater. When you’re doing a dive operation, there’s a little part of you that thinks, “This is badass.” I think about that every time I eat a raw oyster. Shop and learn more at TheOysterBed.com. See the Oyster Bed evolution, from muffin tin to finished product. 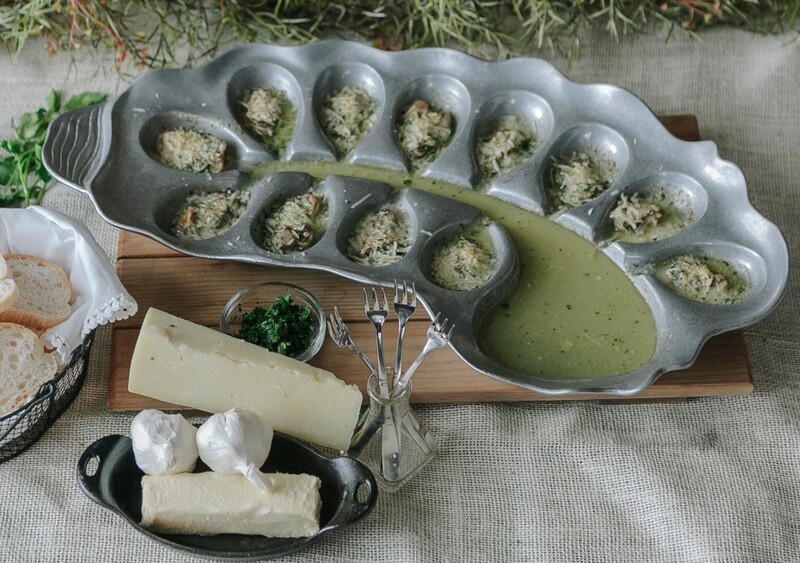 Find 50+ baked oyster recipes, all easily adapted to the Oyster Bed. Oyster Obsession contributor, Susan Ray, is a writer, editor, and communications professional based in Birmingham, Ala. A former book editor, Susan has edited books for Southern Living, O the Oprah Magazine, Country Living, and other publications. Photos courtesy of The Oyster Bed and In A Half Shell.